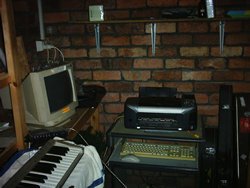 Thought I'd take some pics of the studio to show you ... it's pretty primitive. 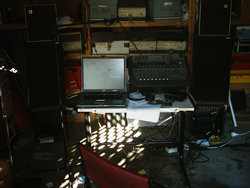 It's in one half of my garage ... and cannot be sealed away from the weather, though I can keep most of the nastiest conditions out ... :-) I have my Digi002 and laptop on the desk, with the Digi002 sitting on top of my power amp, which is connected to two sets of speekers via a small three-way switch. The smaller speaker (on top) are ancient PYE Hi-Fi speakers from my parents old record player when in was a kid. The larger pair are much newer Phillips three-way bins. Much nicer sound. I need to get them higher off the ground. 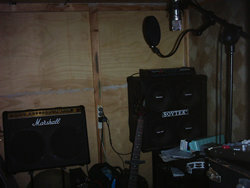 The mic is a Rode NT1-A. The rest is labelled except for the 5-string bass, which is a Fender Squire.